Social media platforms have become powerful tools to collect the preferences of the users and get to know them more. Indeed, in order to build profiles about what they like or dislike, a system does not only have to rely on explicitly given preferences (e.g., ratings) or on implicitly collected data (e.g., from the browsing sessions). In the middle, there lie opinions and preferences expressed through likes, textual comments, and posted content. Being able to exploit social media to mine user behavior and extract additional information leads to improvements in the accuracy of personalization and search technologies, and to better targeted services to the users. In this workshop, we aim to collect novel ideas in this field and to provide a common ground for researchers working in this area. 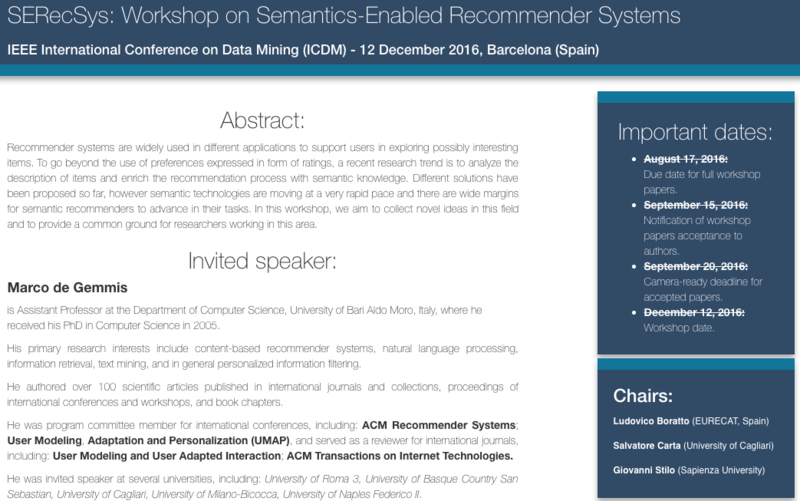 Recommender systems are widely used in different applications to support users in exploring possibly interesting items. 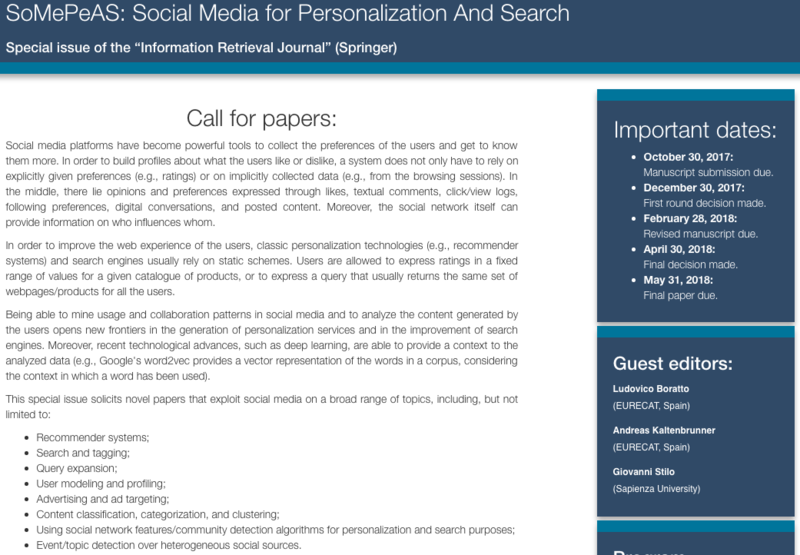 To go beyond the use of preferences expressed in form of ratings, a recent research trend is to analyze the description of items and enrich the recommendation process with semantic knowledge. 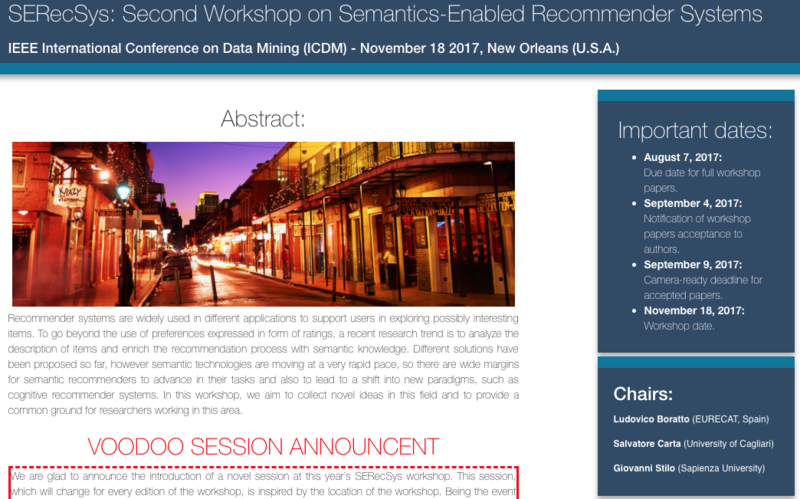 Different solutions have been proposed so far, however semantic technologies are moving at a very rapid pace, so there are wide margins for semantic recommenders to advance in their tasks and also to lead to a shift into new paradigms, such as cognitive recommender systems. 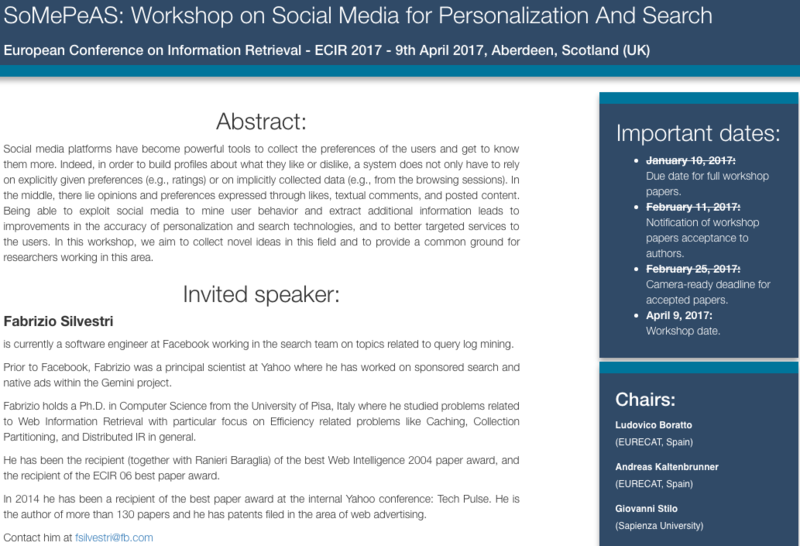 In this workshop, we aim to collect novel ideas in this field and to provide a common ground for researchers working in this area. 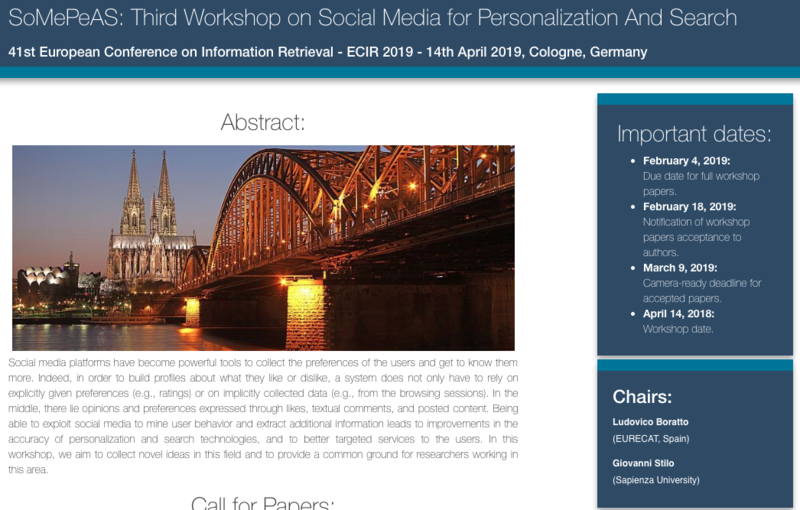 The data collected in social media platforms has become an important source of information, usually exploited by a social recommender system to generate suggestions inside the platform. However, social interactions take many forms that go beyond what happens inside social media platforms, both online (e.g., chats) and offline (group activities performed together), and include “indirect'” forms of interactions, such as editing and reading collaborative resources. 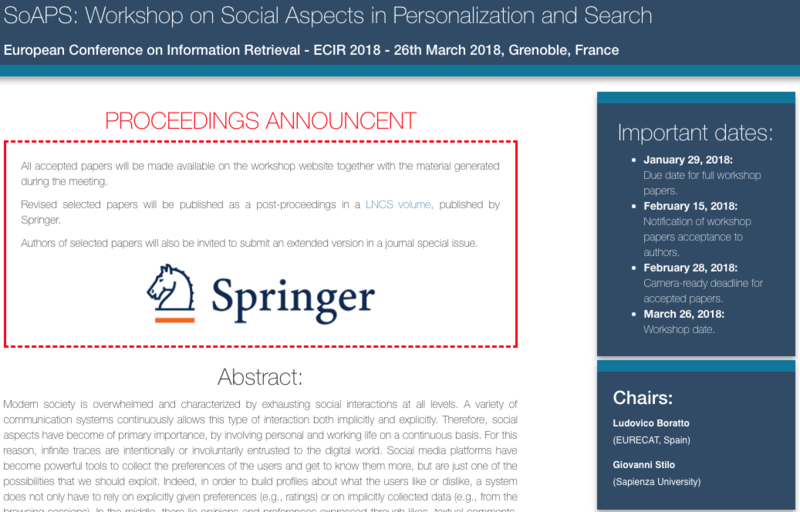 The aim of this workshop is to collect ideas on social interaction-based recommender systems, i.e., systems that in their processing consider the social interactions of the users in novel ways. 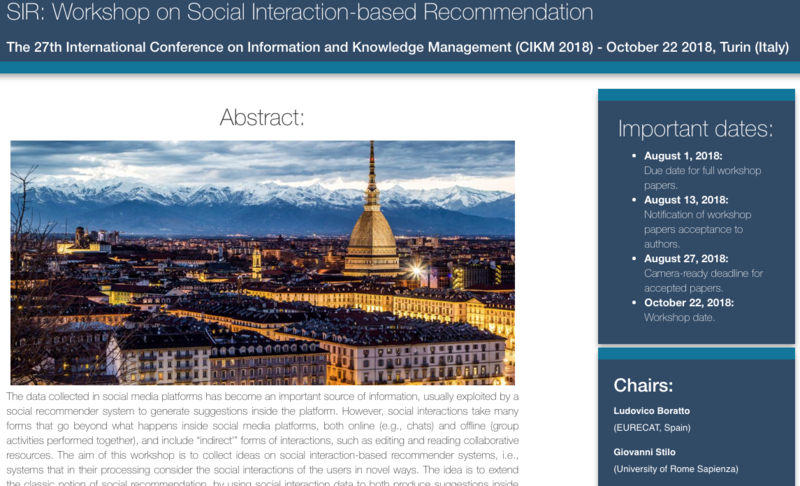 The idea is to extend the classic notion of social recommendation, by using social interaction data to both produce suggestions inside the social media domain (e.g., recommending persons or social media contents, as in social recommenders) and to improve the existing recommendation technologies in other contexts (e.g., online news, online shopping, healthcare, etc. ).